What’s sexier in the Age of Trump than a book about the influence of celebrity? 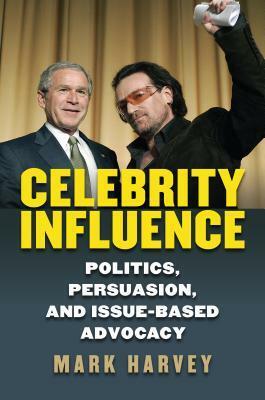 The study of celebrity politics is new to political science, however, and provides fertile if congested ground for academician Mark Harvey in his book Celebrity Influence: Politics, Persuasion, and Issue-Based Advocacy (University Press of Kansas, 2017). His book is an extension of a study about how celebrity impacts the political process, nearly completed just prior to the election of Donald Trump. The author is the director of graduate and undergraduate programs at the University of Saint Mary-Overland Park Campus in Kansas. The Trump election apparently waylaid his through-line, as Trump appears in unlikely places in the book, interrupting the flow. At the same time, many of Harvey’s examples seem dated. Bono’s relationship with George W. Bush seems to be a source of continual fascination. As he tells it, Bono “had a free-access backstage pass to the G8 summit and pressed Bush and others to sign a communique pledging $50 billion in debt relief to some of the poorest countries in the world.” The cover of the book features a full-color photo of Bush with Bono, perhaps a harbinger. He recycles the relationship between Frank Sinatra and FDR without an equal elaboration of the volatile relationship between Sinatra and JFK. He also mentions the advocacy by Bob Dylan of Martin Luther King, Jr’s work without evaluating its impact. He reminds us about Elvis Presley’s stoned visit with Richard Nixon in the White House, there just long enough to collect a lawman’s badge, and to announce that “the Beatles had been a real force for anti-American spirit.” In this case, Elvis made Nixon look hip as the photo circulated around the world. But what did that tell us? It didn’t quell the growing anti-Nixon and antiwar sentiment. Why would a President give a rock star that kind of power and exposure? With Trump blocking his view, we don’t hear nearly enough about the celebrities who became politicians then returned to their celebrity, such as Jerry Springer, Clint Eastwood and Arnold Schwarzenegger. And it’s more than schadenfreude to enjoy reading about celebrities who lacked the necessary credibility in the areas in which they advocated. While George Clooney and Angelina Jolie were believable, basketball star Dennis Rodman’s fame wasn’t enough to have us accept his characterization of Kim Jong-un as “an awesome guy” with “great leaders” in his ancestry. In fact, athletes tend to have far less influence than entertainers. One of the more intriguing sections is about a relatively anonymous puppeteer behind the scenes, but he only gets a few paragraphs. John Pendergast is an activist who worked for the National Security Council and was a special advisor to Susan Rice in the State Department. Pendergast has been a significant facilitator in helping to connect celebrities to causes and to enable them to deliver their messages effectively, sort of an agent for political influence. The few sentences leave the reader wanting more, as this connection is critical to the effectiveness of the celebrities’ influence. The purveying of this kind of influence is relatively new, he maintains. Before the end of the twentieth century, it was the musicians who stood out as vocal advocates—Harry Belafonte, Marian Anderson, Paul Robeson. In this, though, he ignores the strong protests during the McCarthy Era, led by some of Hollywood’s most famous citizens—Humphrey Bogart, Gene Kelly and Judy Garland for starters. And he completely omits one of Hollywood’s first successful political transplants: George Murphy, the song-and-dance man who beat out the more experienced JFK press secretary Pierre Salinger for a seat in the U.S. Senate from California. All during the campaign, Murphy’s old movies were rerun on TV, putting the wannabe politician’s name and face in front of the voting public. The celebrity has to have credibility and have a familiar face to voters. And while many have advocated for various causes (usually liberal ones, though this is not discussed at length), “celebrities’ abilities to change attitudes appear to be stronger than their abilities to inspire action.” He cites John Lennon’s theatrics with Yoko Ono, protesting “the evil establishment” during the 1960s, evoking little measurable change in politics but infusing an entire generation with a major attitude shift. Books on celebrity and its incarnations are everywhere. Harvey is trying to bridge the gap between the academic world and the commercial book market. The two authors who have been conspicuously successful in doing this are Neal Gabler and Neil Postman, neither of whose work appear in his lengthy bibliography or are cited in the text. Readers may be left wondering if the book was written for them. Is it an attempt to present an academic case to other political scientists? Or is it intended for general audiences with a high tolerance for academic citations? And less Trump would have been far better. It’s too early for conclusions about his influence on the body politic. In this book, it roils the waters and dilutes his findings to some extent. For the most part, the book is a good read, in spite of the frequent detours. As an academic, he parses out the nature of celebrity without adequately exploring its power. In his conclusion, he writes, “One of the general finds of this book is that power is more broadly distributed than many political scientists believe and that this power may be concentrated in certain kinds of public figures who are often not considered conventionally powerful or political. And yet, he avoids addressing the bottom line: is the use of celebrity to promote issues or candidates a good thing? Perhaps most alarming is the reality that the cry of fake news now means that even celebrity credibility has become a partisan issue.